It’s now been over two years since Related California cut 99 residential units from their development plans for Transbay Block 8 and reduced the project’s proposed grocery store space from 22,000 to 12,500 square feet, a reduction that rendered the space too small for a large grocer like Whole Foods or Trader Joe’s. 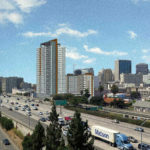 While the approved development agreement for the 548-unit building to rise up 55 stories in height upon the City’s former Transbay Block 8 requires Related to use “good faith efforts” to obtain a grocery tenant “on commercially reasonable terms,” with a full-service grocery having been deemed “very important” to the development of the Transbay District and its future residents by the City’s Office of Community Investment and Infrastructure, Related could seek approval from the City “to reprogram the space for another use” if a lease hasn’t been inked at least 12 months prior to the anticipated completion date of the grocery store space which is currently slated for August 2019. 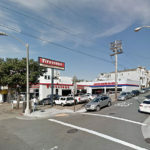 And according to Related’s latest update to the City, neither Bi‐Rite nor Gus’s Community Market have expressed interest in the future space along Folsom between Fremont and First nor has another operator. And with the expected opening of the new “Avery” tower and retail space at the base of the development on Transbay Block 8 (aka 450 Folsom Street) now less than 12 months away, Related is now formally requesting to terminate their obligation and repurpose the space rather than provide a new full-service grocery to serve the neighborhood. 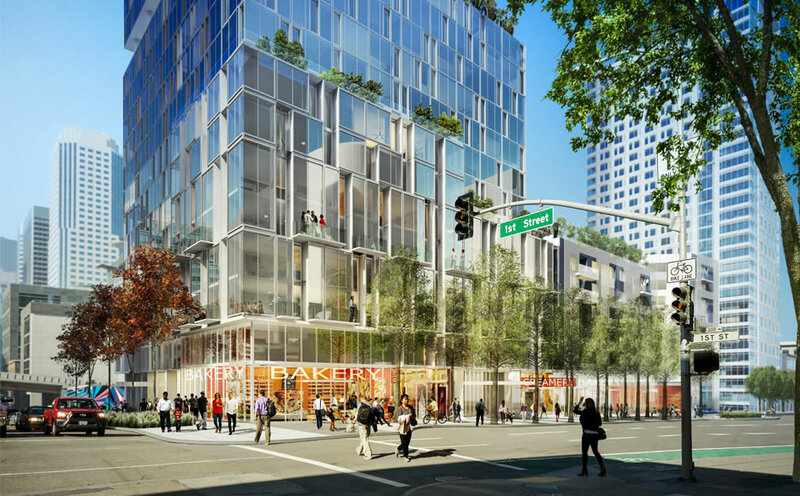 And yesterday, the City formally released Related from their obligation to open a full-service grocery store on Transbay Block 8, a move which shouldn’t catch any plugged-in readers by surprise. Still don’t understand why the city let them downsize the space so much to begin with, if the goal was indeed a large full-service grocery chain. Bizarre. Regardless, I would be shocked if a Walgreens/CVS/Target Express with a small cheap grocery section doesn’t open in the Transbay area in the coming years. Separately, why the heck hasn’t Rainbow opened a second store in SF, or Berkeley Bowl opened a first? Seems like a huge obvious market for those high end purveyors—in essentially any central neighborhood. Even mid-Market St would probably be a success. You think Berkeley Bowl is a “high end purveyor”?? ‘cuz they offer free-range quinoa or 1813 types of chess or something?? Or am I mis-reading your remark ?? Yes, Berkeley Bowl is a “high end” grocery—very different in its offerings than TJ’s or Safeway. They are aimed at a different type of shopper, and it’s bizarre that they haven’t opened a store in SF. (2) Logistics: BB is really a huge produce section with a few center aisles attached, and I don’t think it’s just coincidence they’re both convenient to the Produce Market in Oakland…without a delaying transbay trip in the way. Rainbow is very expensive; don’t know about BB, but I assume it’s the same affluent and “earth conscious” crowd. Regardless, BB could open one in Bayview/Dogpatch to be near SF’s produce market! And no idea why Rainbow won’t expand. My impression is that BB is dirt cheap – pun intended – on produce, and competitive on the rest (I can remember finding head lettuce for 29c when it was $1+ at the majors…thought it was mismarked); at least with the original/relocated store on Shattuck, the newer one in West Berk has a somewhat different atmosphere about it. berkeley bowl locations are big, there’s no way they will fit into one of these spaces. I think they would sooner open a 3rd east bay location than deal with the bridge going to SF, besides the large cost that a location there would require. I’m pretty sure they catch a break from berkeley city government to maintain the stores in berkeley. I’m working on a mixed-use project in LA and Trader Joes is asking for 12,500 sq ft on the ground floor as their shell space. Why wouldn’t that work in SF? My guess is because this one is split between two levels—ground floor and basement. Sounds like an awful design…but someone could make it work. Because Trader Joe’s who I spoke to says this building is to close too their other location. I live across the street from The Avery and go to a lot of meetings for this issue. This is truly a missed opportunity that would benefit so many. So: developer promises amenity in exchange for planning permission, receives that permission, intentionally redesigns the project to make promised amenity undeliverable after receiving said permission, then gets let off the hook after complaining that they can’t deliver on their promise even though they tried really hard, honest! And the city goes along because they don’t want an empty storefront. And it couldn’t possibly have anything to do with the fact that there is a similar-sized woodlands market exactly 1 block away?